The motorcycle helmet is one of the most visible pieces of equipment that the motorcyclists wears on every ride that is taken, and sometimes riders want to be able to show off a little by sporting the latest and greatest accessories. 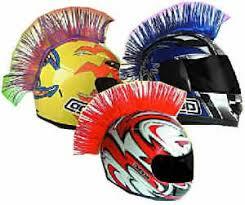 One of the hottest items on the market today are the motorcycle helmet Mohawks for a number of reasons including the fact that they can add a little more color and creativity to the helmet, they allow the rider to express themselves more, and they don’t cost a lot of money and are high quality items. The helmet Mohawk is one item that can really help spice up your helmet if you’ve got just the basic flat black coloring or a minimal amount of graphics. Helmet Mohawks are available in a wide range of colors including red, orange, purple, green, blue, and yellow, just to name a few. This great item can help add the much needed life to your plain old helmet. Chances are you’re not happy about having to wear the helmet in the first place, so the helmet Mohawk will give a reason to be excited about putting on the helmet when you head out for a ride. One reason that your excitement level will increase when you put on your helmet with the newly attached helmet Mohawk is that it gives you a sense of individuality, or a little more attitude to your rider persona. This great item will help you stick out of the crowd a little better in order to let everyone feel your presence. Motorcycle helmet Mohawks are fairly inexpensive which means that they can be easily purchased without a lot of commitment on your part as far as budget goes. You can typically find these items in the range of $25 to $30 depending on the style of Mohawk that you are looking at buying, and you can typically find them online pretty easily. Helmet Mohawks are attached to the helmet with suction cups and most Mohawks that you find out there will have enough holding power to remain attached in high winds so you won’t have to worry about them falling off. If you’ve been wanting to add a little extra to your motorcycle helmet, but just aren’t sure what you want to do with it yet, you may want to consider the helmet Mohawk as your first option. You’ll be happy with the way that it makes your helmet stand out in a crowd.